You probably know that eating a balanced diet is great for your loved one’s physical health, but did you know that sticking with healthy choices, like memory boost foods, can also help to improve your parent’s mental health? “You are what you eat” is true for both body and mind, and your brain needs power and sustenance just like any other organ. 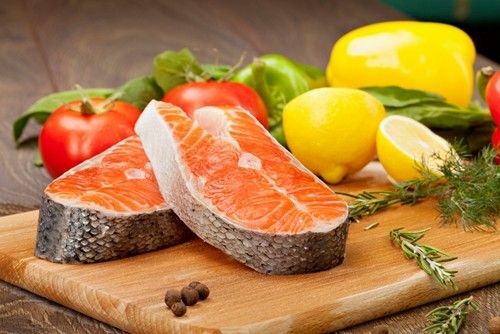 These types of proteins are loaded with omega-3 fatty acids. Omega-3s may help lower the risk of dementia, and could also improve your father’s ability to remember and focus more attentively. Omega-3s also provide “good” cholesterol, so these types of fish are great for his brain and heart health. These sweet treats are delicious and easy to find, and they can even help improve memory or delay short-term memory loss. Blueberries are also easy to include in your morning cereal or yogurt or can simply be eaten by the handful as a tasty mid-afternoon snack. We need carbs to power our brains, but whole grains add an extra healthy punch because they have a low glycemic index. Rather than the “sugar rush” you experience from processed carbs, whole grains feed a steady supply of glucose into the bloodstream. This allows for a more balanced mental state throughout the day. To up whole grain intake, be sure to include brown rice, whole grain breads and pastas and bran cereal on your father’s grocery list. Does your dad have a sweet tooth? Not to worry – dark chocolate is actually a great thing to include in his daily diet (in moderation, of course). While it does contain caffeine, there are only small amounts of it compared to sodas, tea or coffee. There are also plenty of antioxidants in dark chocolate, which can fight off free radicals that impede cognitive function. While water isn’t technically a food, becoming dehydrated can lead to weakened or even shrinking brain tissue. An increased amount of medications can also cause dehydration, which is common as we age, so this means that your dad needs to be drinking at least 2 quarts of water per day, or about half his weight in fluid ounces – whichever is higher. Eating right is important for your father’s health, and these Superfoods can give him the nutrients he needs to keep his body and mind in a healthy state. Find out how we provide nutritious, delicious meals at Aegis Living, which often include memory boost foods like Superfoods.